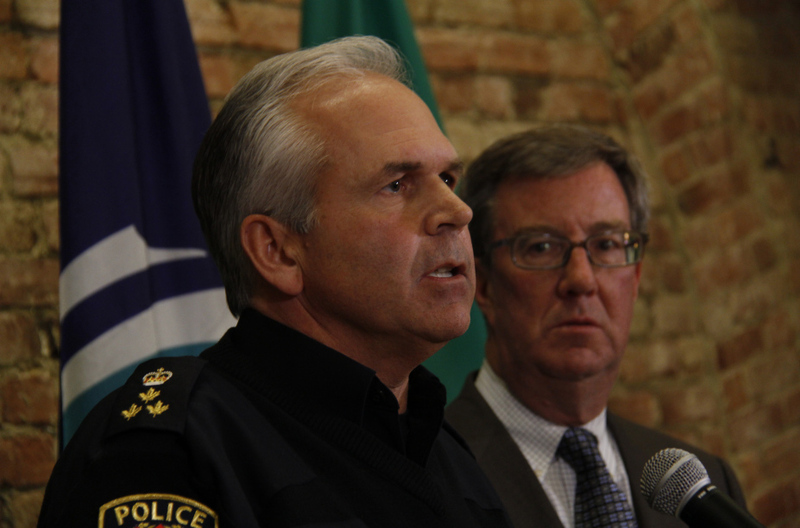 Ottawa Police Chief Charles Bordeleau speaks to reporters about the recent shootings on Monday evening, while Mayor Jim Watson looks on. The city saw a record 49 shootings in 2014. After a record number of gang-related shootings last year, Ottawa is looking at ways to keep gang members from returning to crime after leaving jail. Drug turf wars, property disputes, lack of gang leadership due to recent arrests and even fights over girlfriends have been the cause of the shootings in recent weeks, said Bordeleau, noting they are all targeted. The city has asked staff to review programs on how to dissuade young people from joining gangs and keep existing members from returning to crime after spending time in jail. Currently, the police “engage with” those who have been arrested or victims of gang-related shootings on exit strategies. An “intimidation factor” makes it tough for gang members to get out, said Bordeleau. Apart from the exit strategies, Bordeleau is confident the Ottawa Police Service’s actions to date – including redeploying resources from other units to its Guns & Gangs division and heavier street patrols – will help address gang violence. He lauded the police efforts at identifying the shooting suspect in the Boxing Day shooting at Tanger Outlet Mall. Last year’s record of 49 shootings is just a “one-year spike” and not a trend, said Bordeleau and Watson. “There are going to be no words that are going to be able to comfort those people in the communities that have seen gun violence on their street or in their parks or outside of school, but we can do our best to … (give people) peace of mind that we are committed to working in a holistic solution,” said Watson. Charles Bordeleau makes me want to puke. The Ottawa Police Chief is a master at Propaganda that is a thin white-wash on what is a publicity stunt to divert attention from the Criminal Nature of the Ottawa Police. The Ottawa Police spends 75% of its 400 Million dollar budget on its "Gender Superiority Program" given the name "Partner Assault". This is a group of Domestic Terrorists who most of the time, Arrest and Charge Male Victims of Domestic Violence because its "heresy", "politically incorrect", and how dare any man ever ever call the police and allege he was the victim of Domestic Violence. The Ottawa Police habitually Fabricate Evidence and Obstruct Justice as part of Ontario's Fascist Program of "Gender Superiority" that has resulted in 99% of custody cases of children being placed in the care of mothers. One of the worst of the Rotten Cops is Detective Peter Van Der Zander who personally fabricates evidence NOT to charge violent women and not only incarcerates male victims of domestic violence but removes children from full time fathers and gives them to women who he knows are the most violent in Ontario. Ottawa Police Supervisors Staff. Sgt. Isobel Granger and Sgt. Norm Friel turn deliberate blind eyes to Criminal offences by Det. Peter Van Der Zander as does the Police Chief of Ottawa who will end up having to resign in disgrace. When you see Black Shirted Ottawa Police, remember that Hitler only took his rage out on the entire Jewish race, and not 50% of its own population. Our Police Chief would make Her Gobels proud. The Ottawa Police Chief has turned a blind eye to a never ending series of Criminal Offences committed by the Ottawa Police, and their associate criminals in Ottawa. The Ottawa Police are very family with OPS File No. 13-7254, that of Obstructing Justice and Fabricating Evidence by one Marguerite Lewis, a lawyer no less, an officer of the court, in "Child Protection" for the "Children's Aid Society of Ottawa". The Criminal offences of Marguerite Lewis was Child Abuse. She fabricated evidence to prevent a child being returned to a male victim of domestic violence because she like most CAS lawyers, are psychopaths with a cult like pathological hatred of fathers. Detective John Gibson of the Ottawa Police reviewed documentary evidence of transcripts and concluded "She lied to the judge, It's perjury" Later he stopped the investigation after having a phone call with another criminal, lawyer Tracey Engelking of the CAS Ottawa who, can at the snap of her little finger, get illegal, "ex-parte orders" for custody of children, which is the Criminal offence of "obstruction of Justice". But don't expect any action by the Ottawa Police than to "shoot the messenger". The Ottawa Police have as a "corporation" acted to Obstruct Justice, Fabricate Evidence, commit the most serious offences against the Administration of Justice and then engage in threats and intimidation to stop any and all publicity while failing to accept responsibility for what is a Criminal Organization, funded to the tune of $400 Million Dollars. What is tragic is that without exception, every single Ottawa Politician from the lowest to the highest turns a blind eye to a Corrupt Fascist Ottawa Police force that are an insult to justice and the Rule of Law. Ottawa Police Chief Charles Bordeleau turns a deliberate blind eye to Criminal Offences by their associates in Crime. You see, the Ottawa Police create their own funding needs, its akin to fire fighters lighting fires to keep themselves in a job. It's a massive fraud upon the citizens of Ottawa when around 75% of their 400 million dollar budget is spent largely on, fascist ideas of Gender Superiority that require "fabrication of evidence" and serious offences against the administration of Justice. Recently the Ottawa Police were provided incontrovertible evidence that Ottawa Lawyer Robie Stewart Loomer committed perjury. Robie Loomer habitually personally swears Affidavits of Service before Court Clerks of the Ontario Superior Court and files them with documents that he swore he had served personally. Just one problem, when he swears the Affidavits of Service, he has often not served the documents and then, when the deadline has passed, later serves the documents "accidentally" missing essential pages. The Ottawa Police were provided with several affidavits from a law officer to the effect that Robie Loomer did NOT serve documents upon them prior to the deadline and when the deadline passed, they called the court and discovered that Robie Loomer had prior to the deadline filed an affidavit of service that he had served the documents personally. Not only are the Ottawa Police a party to a Criminal Offence several Ottawa Superior Court Judges as usual are too cowardly to say anything when a lawyer commits perjury and or obstructs justice in Ottawa. The Ottawa Police is a Criminal Organization that promotes Criminal offences, Child Abuser and domestic terrorism. The problems with the Ottawa police are entrenched Criminality called "Old School Policing". There is no solution other than being declared a Criminal Organization and their disbandment in disgrace. Ask your politician for the Ottawa Police to be disbanded and replaced by some other police force under new management.